What Would An Additional 300+ Music Clips do to Your Audio Library? You're about to discover why thousands of people went nuts when we released the first volume of this package as well as how you can get your own copy of that package, Royalty Free Audio Intros Volume I absolutely FREE! If you've been trying to give your audio and video projects a more professional appeal, this is the exact web site that you need to be at right now. There has never been anything like this package ever offered so inexpensively other than our Volume I of the same series so make sure that you don't miss this. The fact is, it's a jungle out there on the Internet and you want to give yourself every opportunity to be successful. After all, don't you want to capitalize on the huge multimedia market that's booming more and more every day? Sure you do! There's a lot of profit to be had by taking advantage of the raging multimedia trend that's currently growing. There are a lot of people out there creating audio and video projects that they can use online or sell as online digital products and physical products for that matter. Sadly, as you've noticed, many of these videos look like someone created them in their basement and are hard to even finish watching. These are the kind of videos that will give your business a horrible image. If you had professional background music, you could add a much more professional sound to both your audio and video projects. Tired of paying high prices for individual clips and loops? I'm sure you've looked around before you found us. Most Musicians are selling their music with a steep price. They typically sell them PER CLIP! I won't mention names or sites but, if we did the same thing it would cost you $8,985.00 to get as many clips as we have bundled in our Audio Intros Package. Other Musician's have complicated licensing structures and make it difficult to decide if you are actually legal to use it at all! Are you beginning to see the value here? We offer an uncomplicated Royalty Free license and we have 300+ clips all in the same package and all at a price it would cost to take us to lunch! Do you wish that your audios had a more professional sounding background track? How much more money could you make by taking your websites and products to the next level? Can I Get Studio Grade Music Without Paying Studio Grade Prices? Musician produced music that's completely mastered and ready for you to start implementing into your projects! Copy and paste use! Just grab the clip you need, insert it into your project and save it and you're ready to go! Clean, crisp sound that's pleasing to the ear! You'll love the clear and clean sound of your professional music collection (all 300+)! Forget about hiring a musician! You don't need to go hunt down a multi-thousand dollar musician to create your music for you! All the Music Tracks are in the MP3 Format so they can easily be incorporated with any audio or video project. I'm sure you can see the power of this package. Are you ready to finally take control of your financial destiny and get your online business really rolling? The invaluable power in Volumes I and II of the Royalty Free Audio Intros package is so extensive, powerful and revealing, but still easy to use, that you are going to be totally pumped about wanting start applying these audios in your business immediately! Everything you need is laid out clearly so that even a total newbie can make professional audio with amazing speed. You deserve to have all the success, sales and customers that you could every dream of. While this package could easily be sold for as much as $500 (or more) which you see online everyday and our last package did sell 5,000+ copies but I'm not going to go that route! I'm Ready to Purchase Now! So... What is Included in the Audio Intros Package? It's 300+ MP3 Formated Music Clips that you can incorporate into your multimedia projects like: Powerpoint, Video, Audio, Music On Hold, Camtasia Presentations, Podcasts, Websites, Youtube Videos, You Name It! You'll find every genre and musical style and there are many that are focused on 10-15 seconds which make great audio intros and exits. And you'll find longer clips in the 45 second range that can even be looped for background music. With a variety of 300+ clips to choose from, you will be able find something for every project you have! And they are all Royalty Free! Obviously these are just some of the benefits that you are going to enjoy when you instantly download your Royalty Free Audio Intros package. There are so many breathtaking audio tracks that each one is going to seriously push home the incredible value that you've received. Never has it been so inexpensive and so easy to get all of the music that you need for your online multimedia projects! Wouldn't you like to get more respect (and more repeat orders) from people that initially buy something from you? One Fee For Life - You don't have to hire a pro musician to create your music! With your Royalty Free Audio Intros package, you get lifetime rights to the music clips without ever having to pay another fee or ANY royalties ever! That's for life! Copy, Paste & Profit Simplicity - These tracks are mastered and ready to be dropped into your multimedia projects. Simply grab the one that goes with your project, drop it in and save it and you have a complete and professionally finished product! Beautiful Compositions - You can expect beautiful compositions that are pleasing to the ear with every music track that you get in your Royalty Free Audio Intros Volume II package! Get Results Fast - These audio clips are ready to go. Put them in Powerpoints, Videos, PodCasts, you name it! Question: Do I have to know a lot of technical stuff to use Audio Intros? Answer: No, the audios are zipped up (compressed) which means you won't have to download 300+ files. There are only a couple downloads. Once downloaded to your computer, you should be able to click on the files and have them extract the individual audios to a folder of your choice. Then drag the audio files on to the time line of your audio or video editing software and you have professional audio in your product! Question: Will these audios work with my computer? Answer: These audios are all in the MP3 format which is a popular format used today because of it's small size and high quality. MP3 files are easily read in every software package we are aware of, but to be sure you should check your audio or video editing software to make sure it accepts MP3 files. MP3s can also be played on any computer (PC or MAC) just by clicking on them! Question: How does the royalty free license work? Answer: You can use the audio clips in this package in any work, product, or project you are creating. 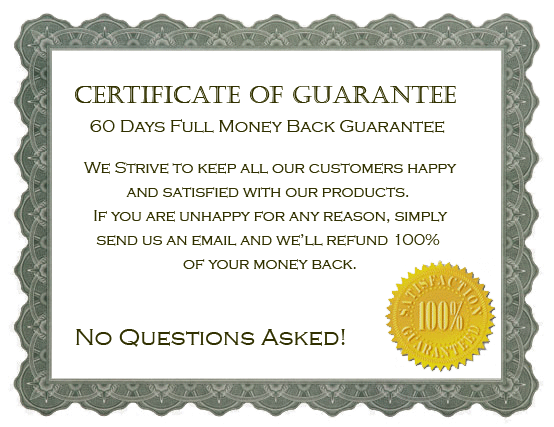 You can sell the resulting work or product with no royalties ever needing to be paid. The only thing you can't do is turn around and sell our package to compete against us! That requires a Private Label Rights license which can be purchased at a much higher price of course. You can contact support if you have any questions or would like information on purchasing a private label rights license. Question: How long will it take to get started? Answer: To make the purchase it will take less than a minute. There are no other offers or upsells. This package has everything you need. Once you make your purchase, you can immediately download the audio and watch the video. How long it takes to download will depend on you Internet connection. The downloads are a couple of 70MB files of zipped up audio but other than that, there is no waiting for anything but you! So get started by clicking on the Add to Cart button below! We've thrown in a video to show you how to easily add audio to your website to help you sell more! And we'll show you how to do it for FREE! We'll Show you the secrets of how to put a customizable MP3 Player right on your website or Wordpress Blog in just a few easy steps! Most websites out there today are paying a monthly service to have their audio play on their website. That can add up to big bucks. That's why this bonus alone is worth the whole price of the package. Don't pay $20/month to put audio on your website. We'll show you how to do it for Free! Please Make Sure That My Secure Order Goes Through Fast So I Am Guaranteed Instant Access To Volumes I and II of The Royalty Free Audio Intros Package! Audio Intros I normally sells for $47 and Audio Intros II sells for $47 but because you landed on this page we are offering both Audio Intros I & II for only $19 if you order right now! That is a savings of $75! This is a one-time purchase only. Only $19 for Limited Time! 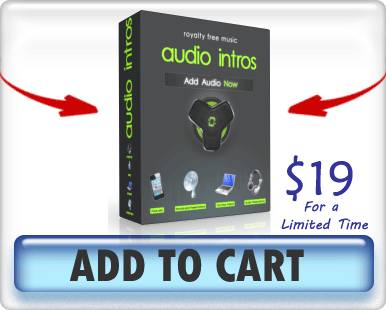 Just by ordering now you are going to get instant access to Volume I and Volume II of the Audio Intros Music Package.. It's not every day that an opportunity like this comes around but when it does, you need to be decisive and take action. Once you start using the Royalty Free Audio Intros Volume I & II Package you are going to feel a whole new level of professionalism that will fuel you to succeed even more! P.S. Remember, success and that professional image you've always dreamed of is just a simple click away! Scroll up, click the ADD TO CART button and you'll be given immediate acces to download your copy of Volume I & II of the Audio Intros Package Instantly! Copyright © 2001-2013 Syncnet, Inc. All rights reserved.